An excerpt from The Sweetness of Grace: Stories of Christian Trial and Victory, Chapter Two: Blessed Are Those Who Mourn (for they shall be comforted), pp. 57-58. We stepped off the subway and onto the multicolored tile floor of the station. As we were swept along with the surging crowd my eyes fell on a beggar. To see a beggar in a subway station was not strange in Seoul, South Korea, but to see a beggar lying prostrate, his face to the ground, was. I don’t definitively remember us giving him change; I only remember his hands, cupped and poking out in front of his head. He didn’t even raise his eyes to those passing by. He simply and humbly begged. A sight such as that would most likely have stayed with me, but on that day all the more because of what day it was. We had just come from the Korean Orthodox Church, St. Nicholas, having celebrated the Sunday of the Publican and the Pharisee. 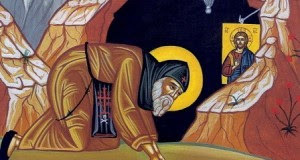 And so, when we saw the man lying prostrate on the ground our minds were immediately drawn toward the icon of the publican: prostrate, humble, not daring even to raise his eyes as he supplicated for mercy. Here in front of us was such a one. What an example of humility right before our very eyes. We walked up the staircase leading to a different subway line, discussing among ourselves the sheer coincidence that we would see such a beggar on the Sunday of the Publican and the Pharisee. Some eighty days later, yet again we encountered our subway-station publican. It was Pentecost Sunday and we were again transferring to the next line. This time I distinctly remember giving him change. First my brother, than my sister-in-law put money into his cupped hands. I reached into my pocket and saw that I only had 300 won (about 30 cents). I cringed that that is all I had, but still I reached down and put the nearly useless amount of money into the beggar’s hand. To my shock he grabbed my hand and pulled it close to his lowered head and kissed it. A kiss from a lowly beggar: perhaps not something most would consider a great gift – or so it might seem to one not on the receiving end of such a gift. I pulled my hand back in surprise. He raised his eyes and I saw he was crying. Tears began to well up in my own eyes. Some man who misunderstood the situation, thinking I was distressed by this beggar, began to come toward us. I made some gesture to show him everything was alright and I turned to go. The feeling that energized in me the moment the dear publican kissed my hand is something very difficult to express. It is very humbling to have one’s hand kissed, even more so when all I gave to the poor beggar was a mere 30 cents. But that is life in Christ: all we have to offer God is a few cents and He gives us back one hundred fold. I never saw our friend again, but I have never forgotten him. Every Sunday of the Publican and the Pharisee he is brought to mind and I reflect on how much his humble gesture, his humble kiss, made me feel like I had received the blessing of a great saint. Truly, angels are disguised in many forms, and encounters with seemingly insignificant people can be as special as those with angels. The following story is from the chapter “Blessed are the Merciful”, pp. 158-159, in The Sweetness of Grace: Stories of Christian Trial and Victory, published by Ancient Faith Publishing. “One of the quickest ways to lose grace is to judge your fellow human being,” the hieromonk told a small group of us after a baptismal service. “Elder Ephraim of Katounakia saw a monk’s soul fall from grace for a simple judgmental thought. There was a brother who would walk around his chapel before services and bang a talanton [the long wooden plank used in monasteries to call people to prayer by hammering a rhythm on it]. However, he lived in an isolated area, alone. A monk judged him for this. He had the thought, ‘What is he doing? There is no one around to call to prayer.’ And immediately Elder Ephraim saw grace depart from the monk who passed judgment. “Don’t even pass judgment in your mind,” he continued. “Fight thoughts: push them out, don’t let them stay in your head, don’t argue with them. If they are strong, confess them right away. When judgmental thoughts come, if you immediately condemn yourself, ‘I’m like this because of my passions,’ then immediately grace will come to your aid, if you fight back with humility and self-condemnation. And with those words we left with the weighty knowledge that one of the easiest sins to slip into results in one of the quickest departures of grace. And here’s a cool video of an Orthodox monk calling all to prayer through the hammering on the symandron. A symandron is basically a stationary talaton. The difference is the talaton is portable, carried in one hand with a hammer in the other. Fun fact: Tradition says that it was by hammering on a wooden plank that Noah called the animals into the ark. And it is by hammering on a wooden plank that monastics call the “rational sheep” into the Ark of Salvation (the Church). Last night, June 22, the Feast of St. Alban the Proto-martyr of Britain, I gave a talk via google videos for a group in Toronto, organized by the Apostle Paul brotherhood. It was on my second book, The Sweetness of Grace: Stories of Christian Trial and Victory, published by Ancient Faith Publishing. While sitting in our domestic chapel here in Newfoundland (the iconostasis and altar are to my right in this video), I gave an overview of the book and read a sample story from each of the eight “Beatitudes” (chapters). Although the video drops a handful of times just after the halfway point it continues uninterrupted. At the end of the talk I mention the Romanian translator of both books, Luminita Irina Niculescu, who reposed in the Lord just two weeks ago. May her memory be eternal! It’s with great joy that I am writing to say the Romanian translation of The Sweetness of Grace: Stories of Christian Trial and Victory, published by Ancient Faith Publishing, is now available for purchase. The Romanian publisher Editura Sophia is offering readers the opportunity to read my simple but love-filled stories in the Romanian language. The Sweetness of Grace (entitled Tot mai aproape de Dumnezeu. Povestiri despre încercări, povestiri despre biruințe in Romanian) is available for purchase here. 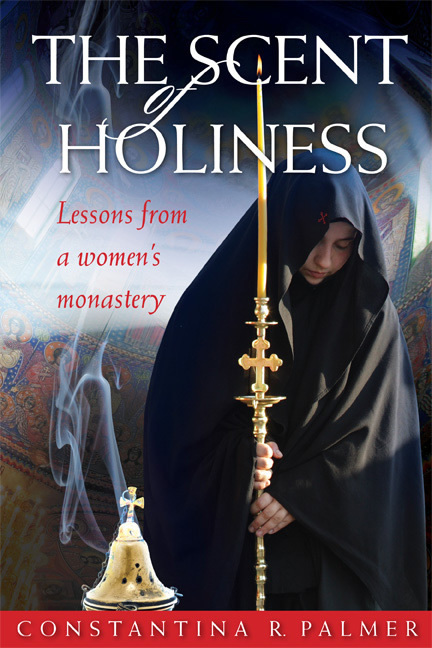 My first book, The Scent of Holiness: Lessons from a Women’s Monastery, was translated and published by Editura Sophia in 2015. The Romanian title is Mireasma sfinteniei. Povestiri dintr-o manastire de maici. It is available for purchase here. In addition to offering these books in Romania, Editura Sophia has provided a great opportunity for bookstores in North America to offer Orthodox literature to their Romanian readers. You may consider carrying the English and Romanian versions of my books in your parish bookstores. I would like to thank Editura Sophia from the bottom of my heart, and most especially the translator Luminita, for this great gift. I am so grateful to them for allowing my stories to be shared throughout the world. My Christ our True God bless them for this work and may all those who read my stories remember me, the unworthy one, in their holy prayers! As is evident, I am a very poor photographer, but it’s nice to see all my books together! Glory to God! Christ is risen! (Update: I had some technical issues, so a version of this post published earlier but some paragraphs and photos were out of sync). In June of last year I received an email asking if I would be interested in speaking at a pan-Orthodox women’s retreat in Saskatoon in April, 2018. I was happy to accept such a gracious invitation and set to work on four one-hour long talks for the retreat. By God’s grace, last weekend I had my first experience of the Canadian prairies and delivered my talks while in the company of wonderful Orthodox sisters-in-Christ. I enjoyed my time so much that I can only hope the women felt as inspired and encouraged by my talks as I did from my experience of Orthodox Saskatoon. This was during the last talk, Saturday night. The ladies placed a chair next to me since it was about 1AM Nfld time by this point. I chose “Keeping Our Spark Alight For Christ” as the retreat theme. The four talks I delivered were designed to build on each other. I drew from a lot of the material in my books The Scent of Holiness: Lessons from a Women’s Monastery and The Sweetness of Grace: Stories of Christian Trial and Victory. As I said in the talks, I don’t have any other stories to draw from since I put them all in my books :). The sub-sections in this talk were: a.) Reverence, b.) Prayer rule, c.) Reading the Holy Scriptures, and d.) Cultivating a relationship with the saints. This last talk had three sub-sections: a.) The Jesus Prayer (this focused more on noetic prayer, or prayer of the heart, in other words the perfect form of the Jesus Prayer), b.) Taking a spiritual inventory, c.) Spiritual endurance. I was trying to structure these talks so as to show a gradual ascent; I was hoping each session would represent a rung of a ladder leading us ever upward. So, I started with the basics and increasingly moved up to the weightier spiritual topics. While it was around 12AM Newfoundland time when I delivered the first and last talks (one was given on Friday night, one on Saturday night), I managed to get through them. Although, I found I stumbled over my words a little more than I did while delivering the other two talks during the day. As you can see from the above side-by-side images, prayers were held in a makeshift chapel for the weekend. I was a touch sad to be in a city with multiple Orthodox churches and to have services in a non-Orthodox temple, since we only have a temporary chapel here in Newfoundland. But, it made sense because the whole retreat was held at a retreat center, so at least we had a place to pray. Sunday evening I had the great joy of visiting Saskatoon’s Antiochian parish of St. Vincent of Lerins where, after evening prayers, we went downstairs for a bite to eat and an informal talk, mostly questions and answers. I especially enjoyed this because I find when people ask questions you get a better insight into what is important to them and I was very impressed to learn how seriously they take their faith. “There is no distance in the spiritual life,” Gerontissa told me on my last trip to her monastery in Greece. Truly, there is neither distance nor strangeness. By this I mean within Orthodoxy you can meet a person for a brief moment and immediately feel one with the person, united, bound through Christ. Glory to God! Below is yet another excerpt from The Sweetness of Grace: Stories of Christian Trial and Victory published by Ancient Faith Publishing. It is from Chapter 1, “Blessed are the Poor of Spirit”, pp. 29-31. During the winter months, the sun had already set by the time I reached the Holy Dormition Monastery of the Mother of God. Vespers was most often held in the large catholicon outside the monastery gates. Entering the outer narthex, I would light a beeswax candle in front of the festal icon the sisters had set out on the icon stand. As soon as I opened the large wooden door to the nave, I would be greeted by the sound of the nuns’ melodic chanting and surrounded by the sweet fragrance of burning incense. 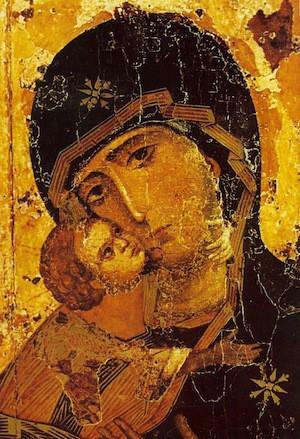 I would then proceed to the large icon of the Mother of God depicted with the Lord on her lap. In those sacred if fleeting moments, I felt genuinely connected to the Mother of God. In the dim light of the church, I could even supplicate her with tears and be noticed by no one. As far away as she seemed out in the world at times, she seemed very near in the sacred space of her holy monastery. To stand in the presence of a holy icon is to stand in the presence of the person depicted therein. Whether we stand before a large icon encased in an elaborately decorated wooden frame or before a paper icon taped on the refrigerator, we are in the presence of the holy person whose countenance is painted in line and color. But in the peaceful, prayerful atmosphere of a holy monastery, we are often more attuned to the spiritual reality surrounding us, which makes our prayer flow more readily and brings the contemplation of holy mysteries within our grasp. It is in moments such as those that I contemplate the person of the Most Holy Theotokos. Thinking on her life and works, her sufferings and sacrifice, I feel she offers us the answer to all our problems. The example of her life is the cure for our illness, the source of joy to heal our sorrow. By means of merely two of her countless virtues—obedience and purity—she teaches us everything. In her obedience to God, she shows us that perfect freedom and the attainment of our full potential are found in submitting our fallen and corrupted will to the all-good Father. Thus we mold our will into His will and therefore become able eventually not only to know the good but to will it and do it. With her outward and inward purity, the Theotokos points us to the easy path of sanctification. By keeping our souls and bodies pure, by not even accepting corrupted thoughts, we maintain the ability to hear and communicate with God and thus learn how to live in conformity to His will. If we have long ago lost our mental, spiritual, and/or physical purity, we have the opportunity to restore them through confession and repentance. These are our constant means of imitating her virtue and, as she does most of all, pleasing her Son and our God. And so, no matter how ill we are, no matter our upbringing, no matter the genetic weaknesses of body and soul we have inherited, no matter the state of the world around us, we have the opportunity, by God’s grace and through the prayers of the Theotokos, to become healthy. We too can, in our own dormition, pass from life to life through a mere falling asleep, if only we will imitate her virtue.